Nitrogen is applied before the fall wheat is planted. Center pivot irrigation is an important agricultural practice in southwest Kansas. Wheat harvest in full swing. That is why Kansas is the "Wheat State"! Soybeans add to the diversity of crops grown in Scott County. The beauty of the rainbow after a July thunderstorm. A promise from God, remember? A Spring prickly pear bloom shines like the sun. Spring fertilizer and weed control are applied to a wheat field. Corn tassels embrace the brilliant blue Kansas sky. A soybean leaf expresses the beauty and intricacy of God's creation. Choice Black Angus beef are produced for the conscientious consumer. Sunset on the broad western horizon. Pastures light up with the electric pink of June brambles. An artichoke blossom in my herb garden. The deep and rich russet of the Autumn grain sorghum crop. The pasture lands of the Chalk Hills are perfect for grazing. Buffalo grass dominates and nourishes beef cattle. Native and cultured flowers dress up a garden border. The annual Memorial Day presentation at Scott County Cemetery is presented by the Wood Chapter of the National Honor Society. Galen Kalbach brings the beauty of his everlastings to the annual Whimmydiddle. Stop by Scott City on the last Saturday in September! 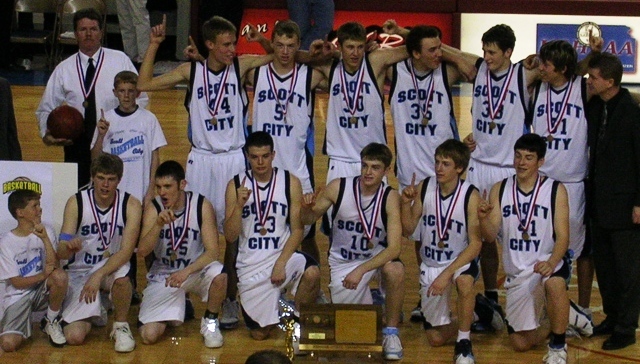 State basketball titles are becoming a nice tradition. Yes, it's all about high school football in Scott City! An herb garden somewhere in Western Kansas. Copyright © 2014 Good Things in Scott City, Kansas. All Rights Reserved.